How we're helping Southern Maryland homebound veterans avoid social isolation. Community, regional and national resources for Veterans and their families. The driving force established for the military community and operated by Veterans. Leads to positions with military-friendly employers. Get the scoop on volunteer opportunities with VConnections. VConnections is a 501(c)3 nonprofit organization. Help support our mission! Did you know that there's an ongoing effort by the U.S. Department of Veterans' Affairs and the Veterans' Health Administration of Rural Health to partner with community organizations that are dedicated and compassionate about serving our veterans and active duty military personnel? Our focus is on the areas of education, health and wellness, and benefits and claims. Are you a veteran living in southern Maryland? Are you a veteran or the spouse of a veteran and unsure of your benefit entitlements? Are you having difficulties getting access to information or the help you need? We are here for you and want to be a dependable resource. Be sure to bookmark this website and visit us often for updates as we continue to expand our offerings. 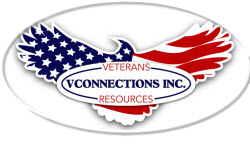 Join our email list to stay abreast of updates, upcoming events, and veteran-related news from VConnections.